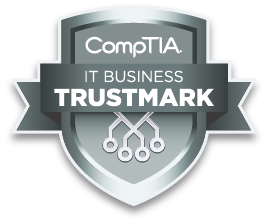 We are delighted to announce that we have received the CompTIA IT Business Trustmark™, a respected industry credential that signifies our commitment to sound business practices and quality service. 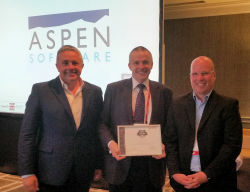 “Earning this credential identifies Aspen Software as a business that meets or exceeds the best business practices the IT industry has to offer,” said John McGlinchey, vice president, Europe and Middle East, CompTIA. The CompTIA IT Business Trustmark was developed by CompTIA, the non-profit association for the information technology industry, in collaboration with industry experts and leaders, to identify IT companies that follow industry best practices related to service agreements, standard operating procedures and systems and tools for delivering services. Neil Smith is pictured receiving Aspen Software’s IT Business Trustmark (centre) from Mark Williams, Chair of the CompTIA UK Channel Community (left) and Jim Hamilton, Vice President of Member Communities at CompTIA (right). Companies that earn the CompTIA IT Business Trustmark have pledged to follow a robust code of practice that meet or exceed industry standard levels of customer service. They’ve also met industry-agreed standards in areas such as data security practices, staff competencies and holding of adequate insurance. CompTIA’s IT Business Trustmark is a vendor-neutral, business-level credential designed to qualify and differentiate high-calibre solution provider organisations operating in the UK. We are proud to be part of that community.